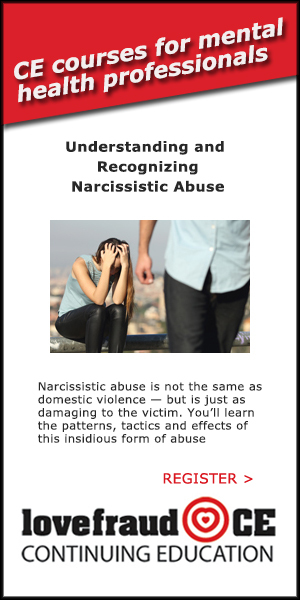 By reading this website, members of the Lovefraud community learn that they are not crazy, they are involved with a disordered personality. It’s their first step towards breaking free. But only the first step. 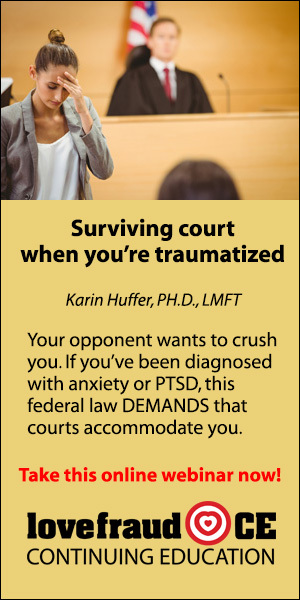 To actually escape, they need therapy. Or a divorce. Or the truth. To finally break away, they need the professional services you offer. You know what to expect in these situations. 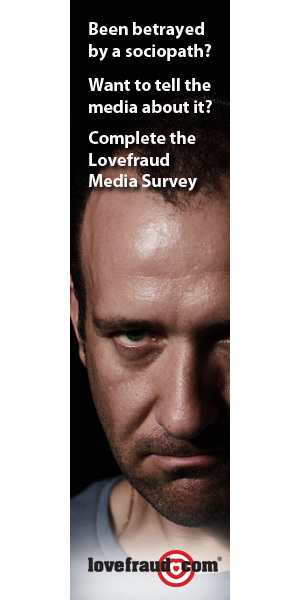 That’s what Lovefraud readers are looking for—someone who understands what they’re talking about. 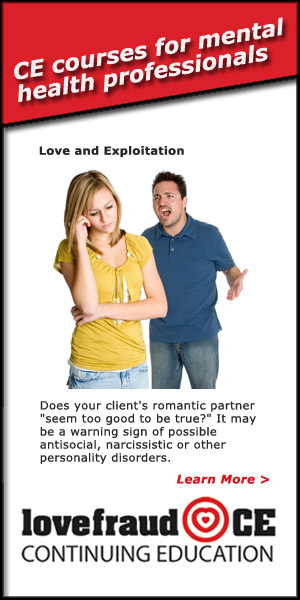 Let them find you by joining the Lovefraud Professional Resources Guide. 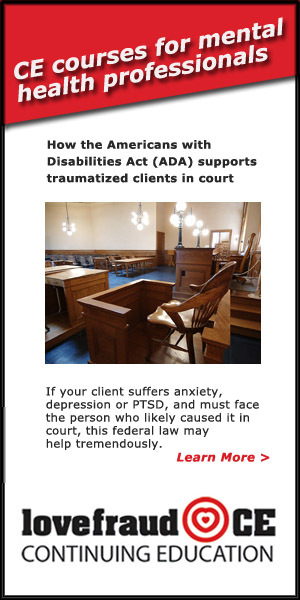 This online directory links professionals who can provide competent services with new clients who are looking for you. 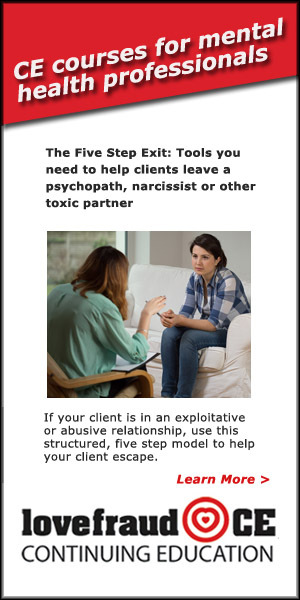 Because you are affiliated with Lovefraud—which many people consider to be the best Internet site about sociopaths—prospective clients know that you are an effective adviser and advocate. Hundreds of people have sent emails and posted blog comments thanking Lovefraud for validating their experience, opening their eyes, preserving their sanity, and even saving their lives. By joining the Lovefraud Professional Resources Guide, you are the beneficiary of all that goodwill. 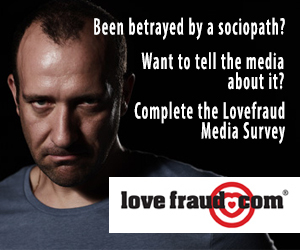 Your membership entitles you to post articles on Lovefraud. This is an opportunity for you to engage in “content marketing,” which is “the art of communicating with your customers and prospects without selling,” according to the Content Marketing Institute. 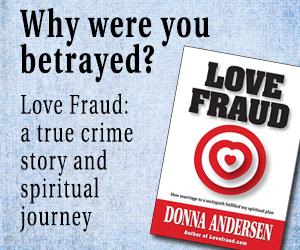 The more articles you write for Lovefraud, the more you will boost your online profile. When readers are looking for a professional, they’ll think of you. Your Lovefraud Professional Resources Guide listing costs only US $8.95 per month or US$89.50 per year probably less than one hour of your time. 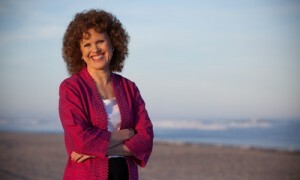 When you sign up, you’ll receive a free ebook: Donna Andersen’s Red Flags of Love Fraud 10 signs you’re dating a sociopath (a $9.99 value). 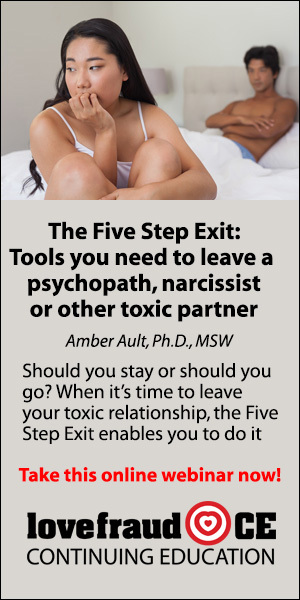 Donna explains how people get drawn into relationships with sociopaths, how they are affected, and what they need to do to escape. Here’s more information. 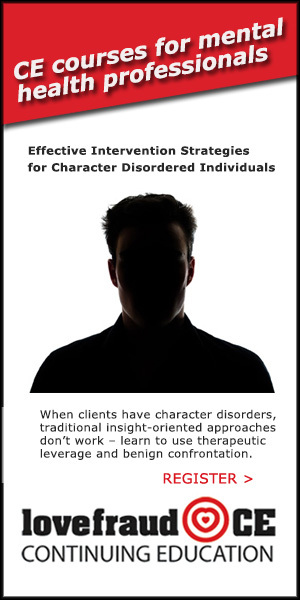 You’ll want to recommend the book to your clients. It is available in all ebook formats. 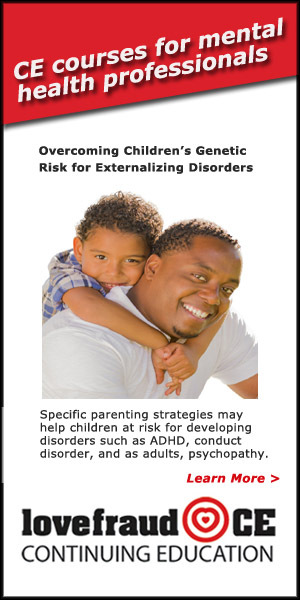 If you have any questions about this directory, please send an email to [email protected] or call 609-945-1384. By proceeding to the Lovefraud Professional Resources Guide, I am agreeing with Lovefraud’s terms and conditions.